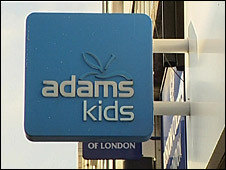 UK childrenswear retailer Adams is poised to go into administration, the BBC has learned. It joins a growing list of well-known chains going to the wall as retailers struggle, including Zavvi, MFI, Whittard and Woolworths. Adams has 260 outlets in its UK chain and 103 internationally, employing about 2,000 people. The firm was bought early last year by Northern Ireland businessman John Shannon, who closed 42 branches. Adams has not yet to be officially placed in administration. PriceWaterhouseCoopers (PWC) are likely to be appointed administrators and take over the running of Adams until a new owner can be found. A spokeswoman for PWC could not tell for sure when it would be formally appointed. The company, which is celebrating its 75th year, was originally founded in Birmingham. Adams also makes clothes for health and beauty retailer Boots. The insolvency experts Begbies Traynor predicted only a week ago that up to 15 national retail chains would go bust by mid-January.